UPDATED: Tue., April 17, 2018, 1:17 p.m.
Money is pouring into both sides in the race for Congress in Eastern Washington. Rep. Cathy McMorris Rodgers, R-Spokane, raised more than $776,000 in the first three months of 2018, according reports recently filed with the Federal Election Commission. Her opponent, Democrat Lisa Brown, collected $649,000 in the same period. 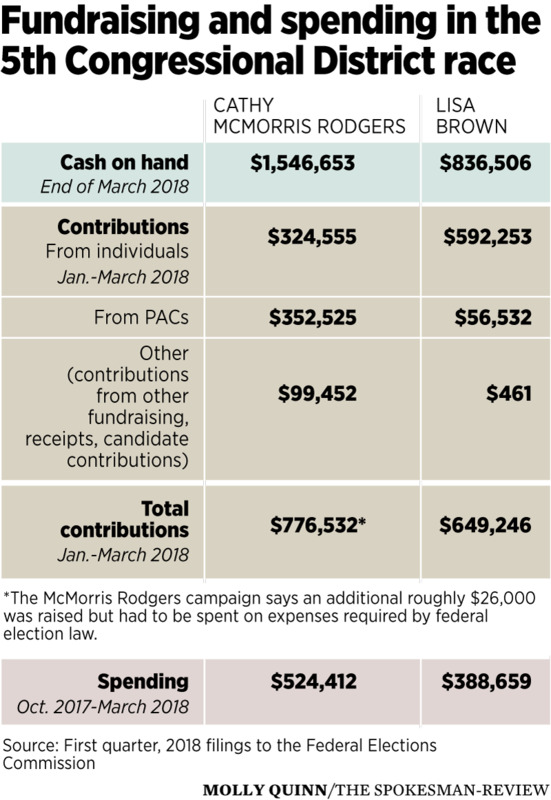 While McMorris Rodgers maintains a large lead in fundraising, Brown’s ability to raise a sizable campaign chest is another sign of what appears to be the closest race the district has seen in more than two decades. Both candidates raised more in the first quarter of 2018 than they did in the last quarter of 2017. But the gap between the two for the period, at about $127,000, is less than the $230,000 fundraising margin between them for the final three months of 2017. The McMorris Rodgers campaign said that her total reported doesn’t include money the congresswoman raised for other committees during the same time period, which totals up to more than $1.25 million. That money is not being used in the contest against Brown, and $103,000 of that total can’t be spent on the 5th District contest because it was made to a McMorris Rodgers GOP leadership committee that is barred by federal law from giving back to her own campaign. McMorris Rodgers’ total for this year includes a nearly $100,000 donation from a joint fundraising committee the congresswoman operates with the Republican Party of Washington State and the National Republican Congressional Committee. Last week, McMorris Rodgers’ campaign said it had raised $803,000 as part of re-election efforts during the first quarter of 2018, calling it a record period. The campaign confirmed that total Monday, saying the amount reported to the FEC showed about $26,000 in paid expenses required by federal election law. Both candidates earned portions of their totals from political action committees, organizations not subject to the same contribution limits as individuals. Brown said she wouldn’t take any money from committees representing corporate interests. The former chancellor of Washington State University Spokane and majority leader of the Washington State Senate did accept $56,532 in donations from committees that support abortion rights and the League of Conservation Voters. McMorris Rodgers received extensive support from political action committees, totaling $352,525 directly to her congressional committee during the reporting period. Major companies that have given $10,000 to McMorris Rodgers’ re-election campaign include Microsoft, Federal Express, Delta Air Lines, the Goldman Sachs Group and UPS. Jim Cowles, former president of Inland Empire Paper Co., gave $20,000 to the McMorris Rodgers’ joint fundraising campaign, which is also not subject to a $5,400 cap on individual contributions to official committees. Inland Empire Paper Co. is a subsidiary of the Cowles Co., which also publishes The Spokesman-Review. Local politicians also are opening their pocketbooks. Individual contributors to McMorris Rodgers’ campaign during the period included Mayor David Condon, a former staff member to the congresswoman; Spokane County Commissioner Mary Kuney; state Rep. Bob McCaslin; and Spokane Valley City Councilman Arne Woodard, according to FEC filings. Brown received donations from Spokane City Councilman Breean Beggs and City Councilwoman Kate Burke. Other city officials, including her husband, Spokane City Council Policy Adviser Brian McClatchey, along with former city attorney Nancy Isserlis and Gavin Cooley, the city’s chief financial officer, also gave to Brown’s campaign. National Democrats also have pouring money into the 5th District race. Committees formed by Reps. Nancy Pelosi, D-Calif., and Steny Hoyer, D-Md., gave to the Brown campaign. The Democratic Congressional Campaign Committee, which has been assisting the campaign since November, has added $5,250 of its money to the contest. McMorris Rodgers has received party support of her own. The Tuesday Group Political Action Committee, a fundraising arm formed by moderate GOP members in 2007, directly kicked in $7,500 to McMorris Rodgers’ re-election efforts. Committees formed by Reps. Steve Scalise, R-La., Greg Walden, R-Ore., Joe Wilson, R-S.C., and Sen. Shelley Moore-Capito, R-W. Va., also made contributions to McMorris Rodgers’ campaign. McMorris Rodgers maintains a wide advantage in the amount of campaign cash she has on hand. The congresswoman reports $1.5 million in the bank, compared to Brown’s $836,506. Editor’s note: A graphic that earlier appeared with this story incorrectly stated why the McMorris Rodgers’ campaign says it raised $803,000 as part of her re-election efforts. The $803,000 includes $26,000 in paid expenses required by federal election law, the campaign said. Published: April 16, 2018, 9 p.m. Updated: April 17, 2018, 1:17 p.m.